While suffering through first grade Hugh’s parents decided to enroll him in art classes since he wasn’t really good at paying attention to anything else. The instructors reluctantly allowed him in the class where he got his first taste of painting with oils and acrylics. Somehow what they taught in art class stuck with him and next thing he knew he was painting landscapes. At age 7, (well before he could even sign own his name) Hugh felt he had mastered painting images of ships, mountains,and boots -he knew he was ready to paint images of things exploding and being destroyed. After many grueling years of being punished in the public school system for sketching, doodling and daydreaming he decided to further his punishment by attending college. 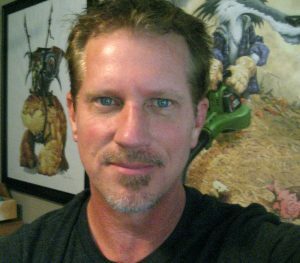 After many-many years of higher education Hugh graduated from Art Center College of Design with a Bachelors Degree in Illustration/ Fine Art. During his artistic career, he has worked for companies like Walt Disney Studios, Microsoft, The History Chanel, DreamWorks, Sony, and Hasbro. Hugh’s art has been used conceptually in video games, book illustrations, 3D computer modeling, collectible card art, as well as illustrations in children’s books. Hugh currently works as a freelance concept artist and illustrator.